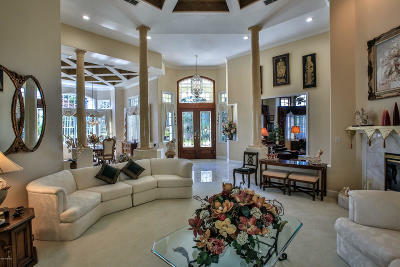 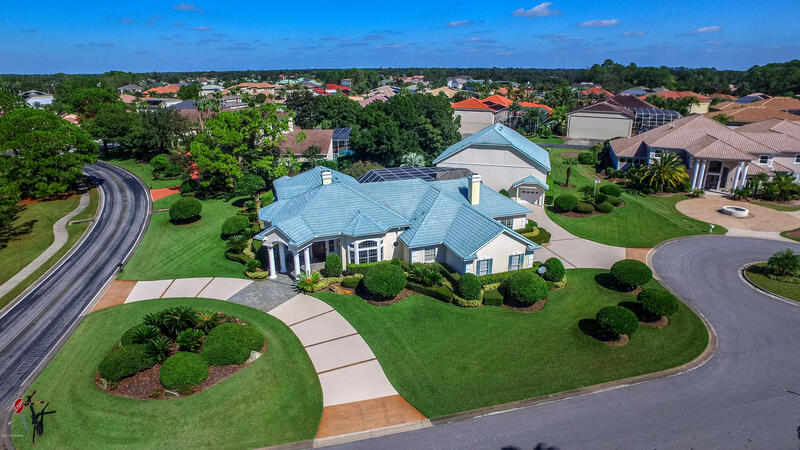 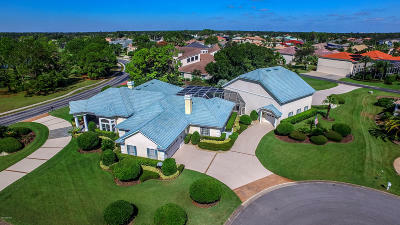 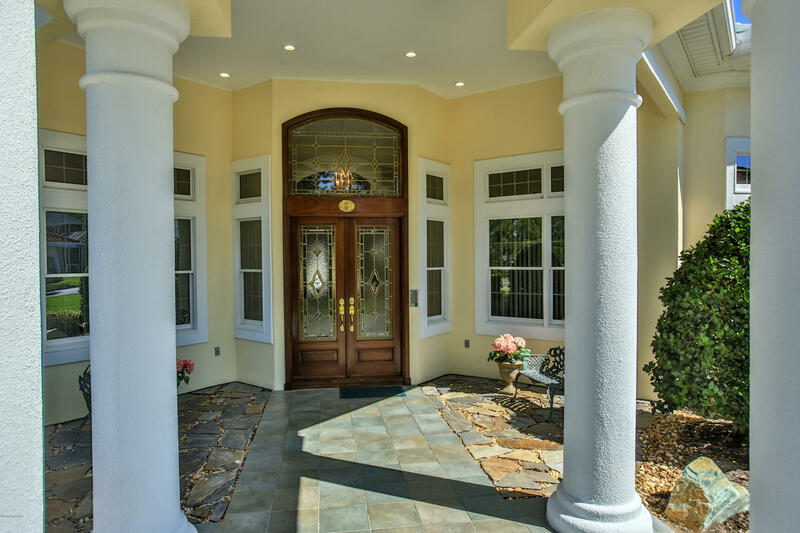 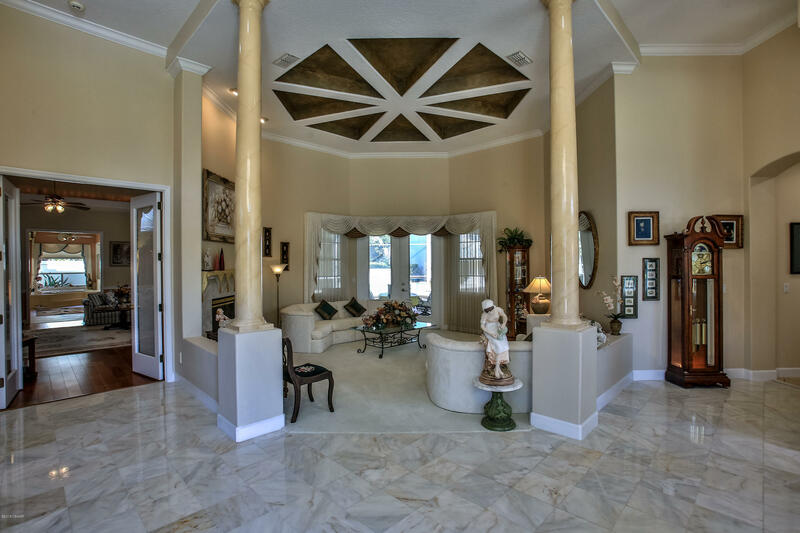 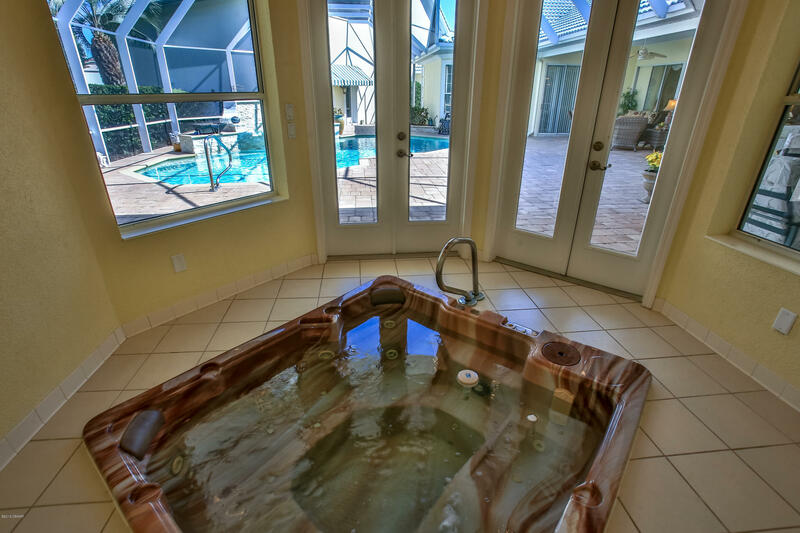 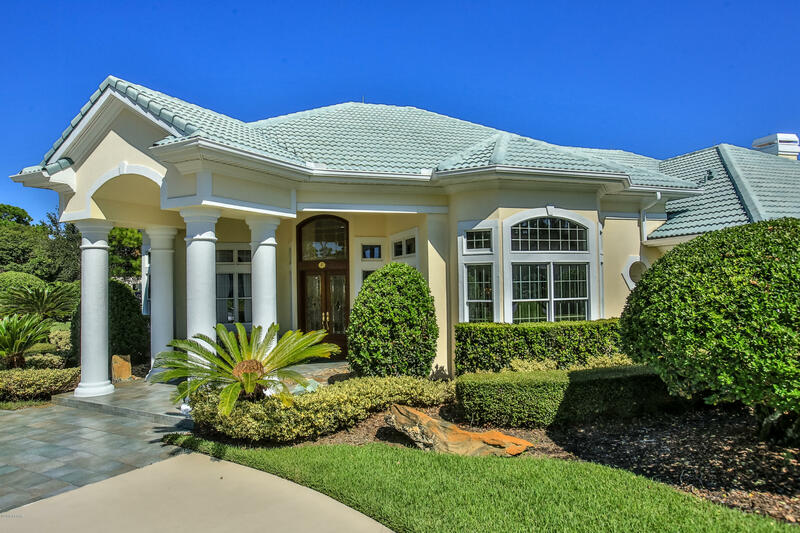 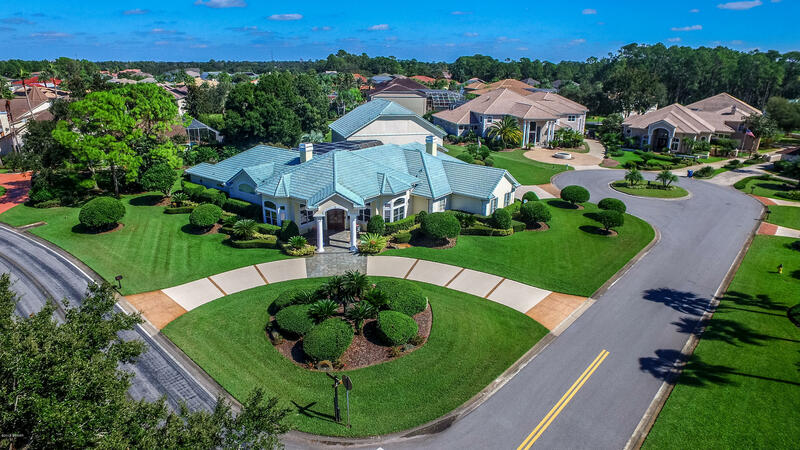 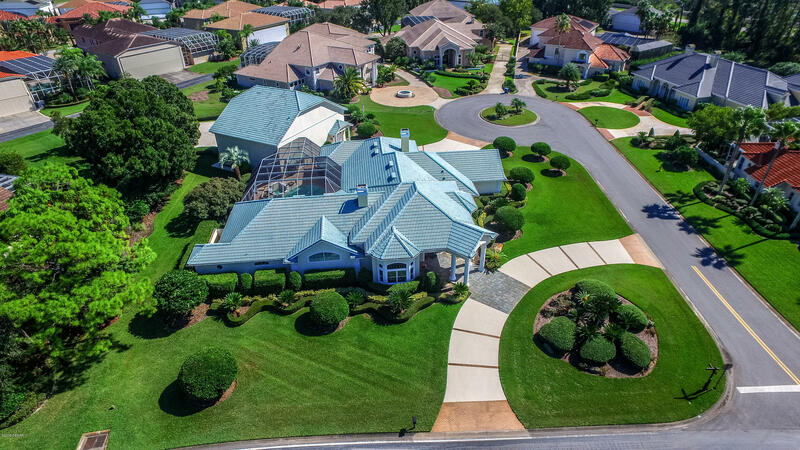 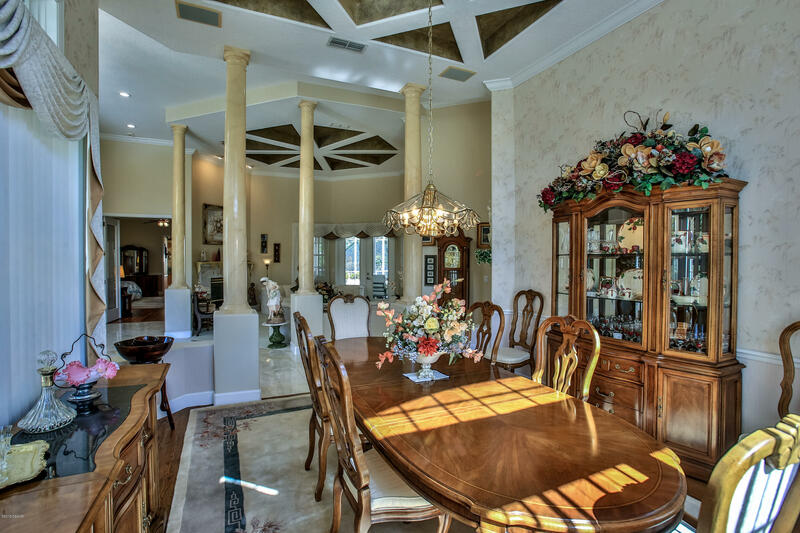 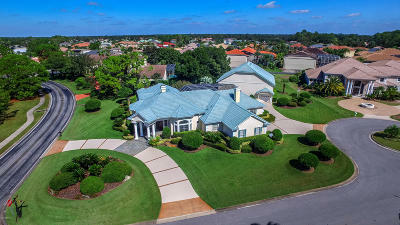 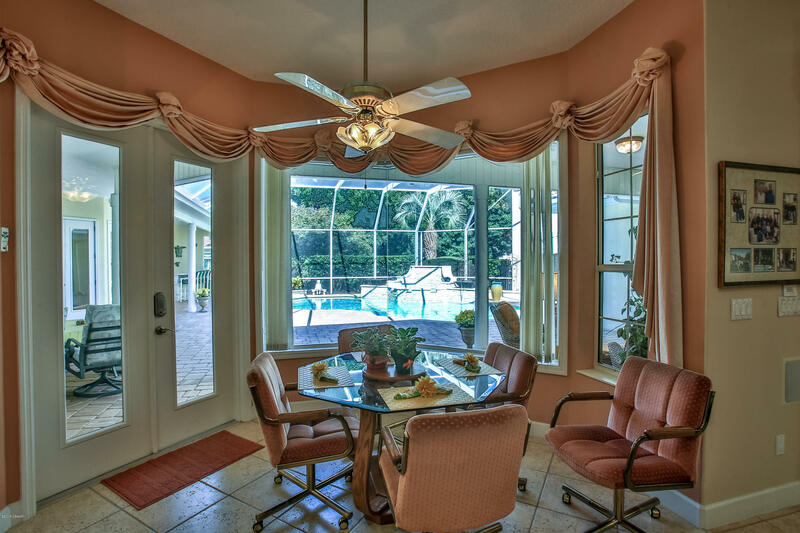 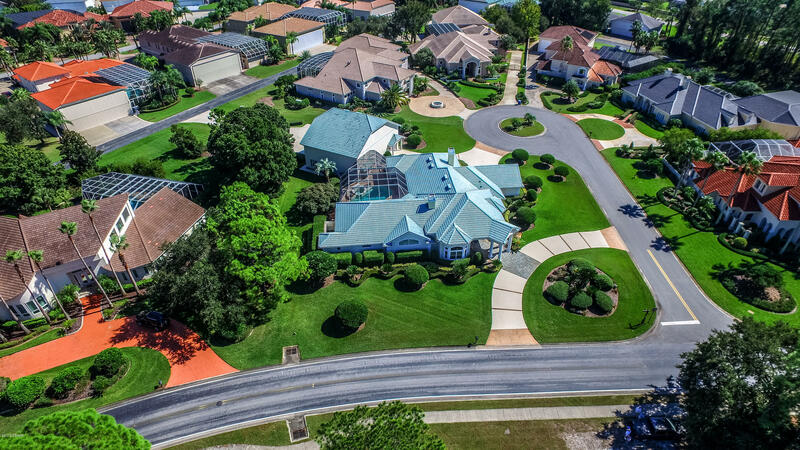 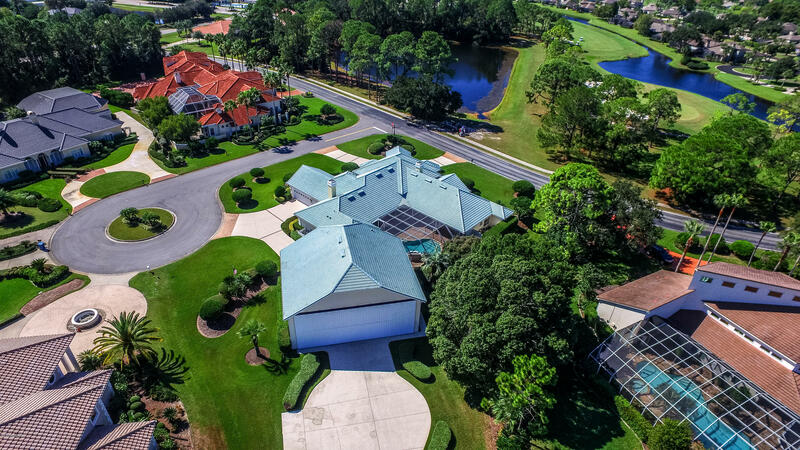 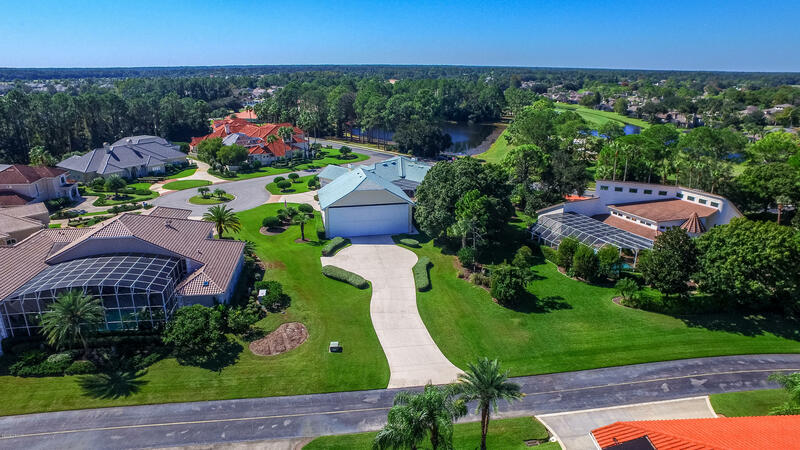 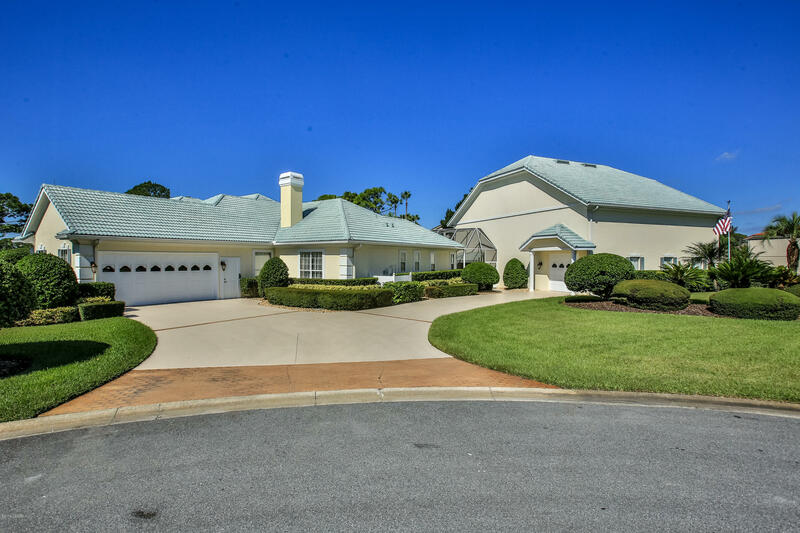 An Executive Hangar Home in Spruce Creek Fly-In, that has been featured and photographed in numerous magazine articles about Spruce Creek all over the world. 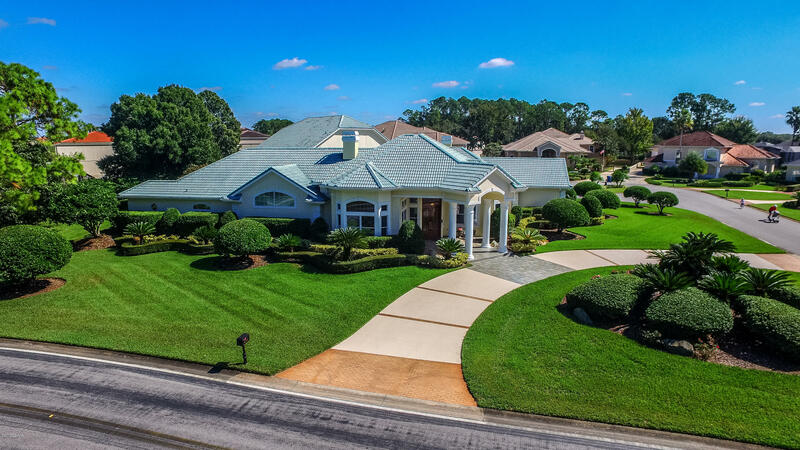 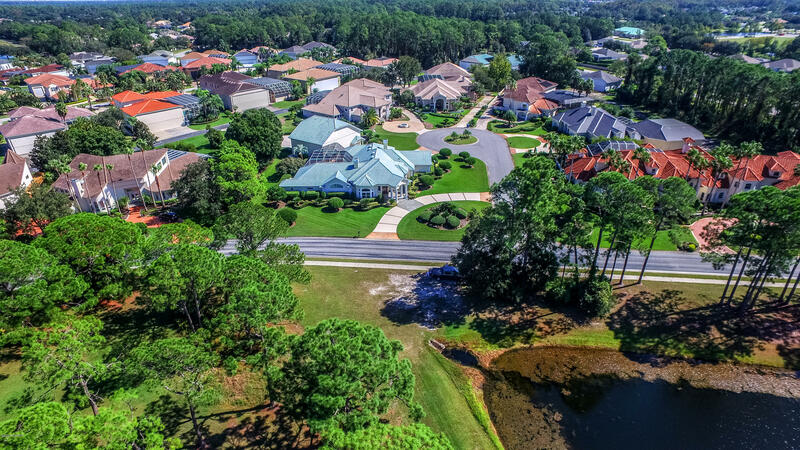 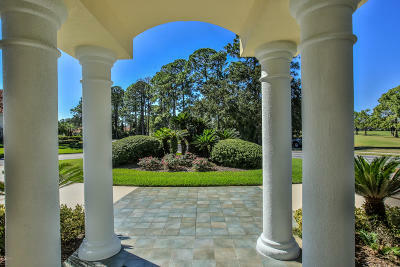 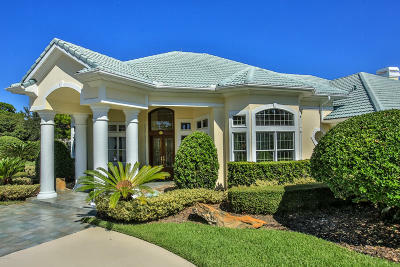 This magnificent 4238 square foot home is on the largest lot in the Glen Eagles section of Spruce Creek. 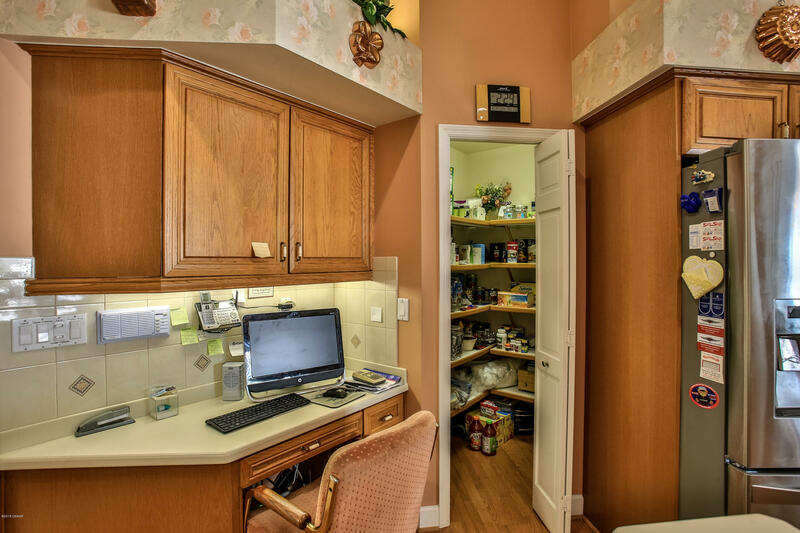 The amenities are too numerous to mention. 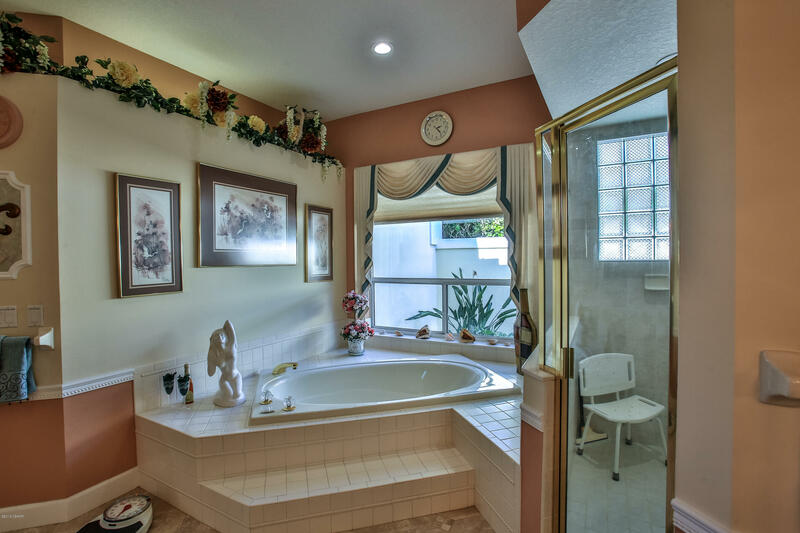 A few highlights: 4238 sq feet house with 3 bedrooms and 4 and 1/2 baths, tile roof, lightning arresters, recent total pool and pool deck remodel. 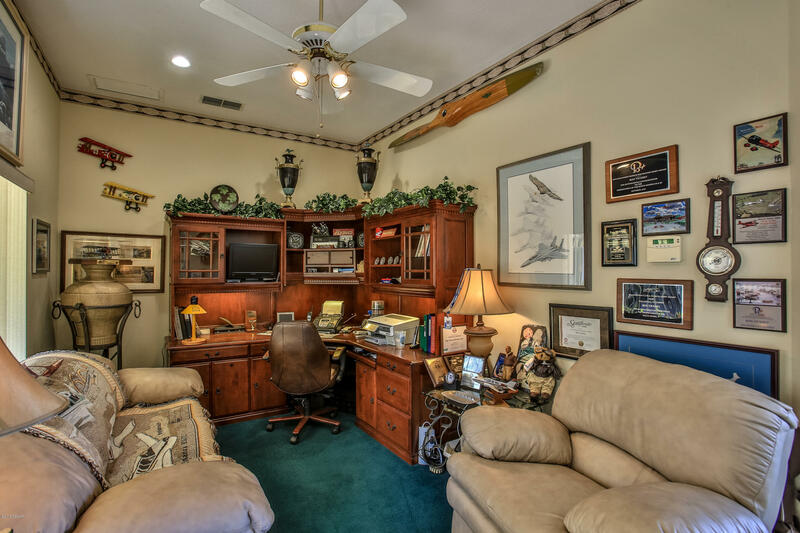 Hangar has office/or additional bedroom with full bath . 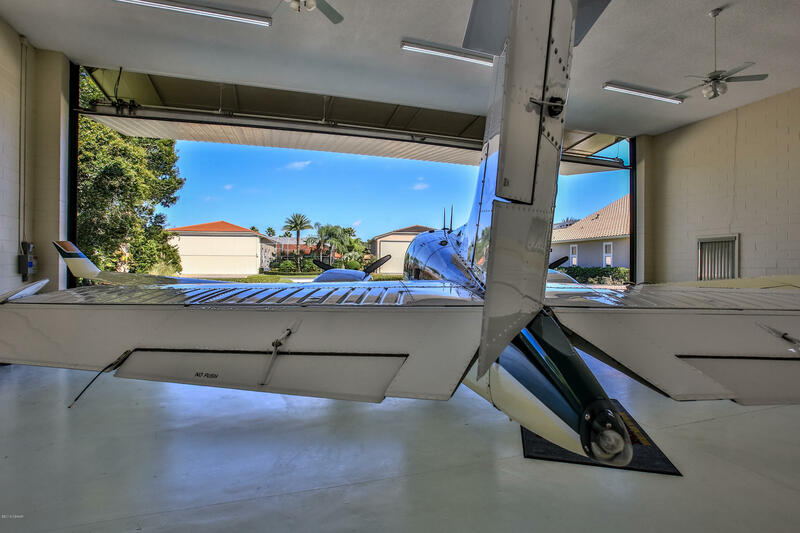 Hangar is 52' x 42' with a 48' x 16' Wilson aluminum insulated bi-fold door. 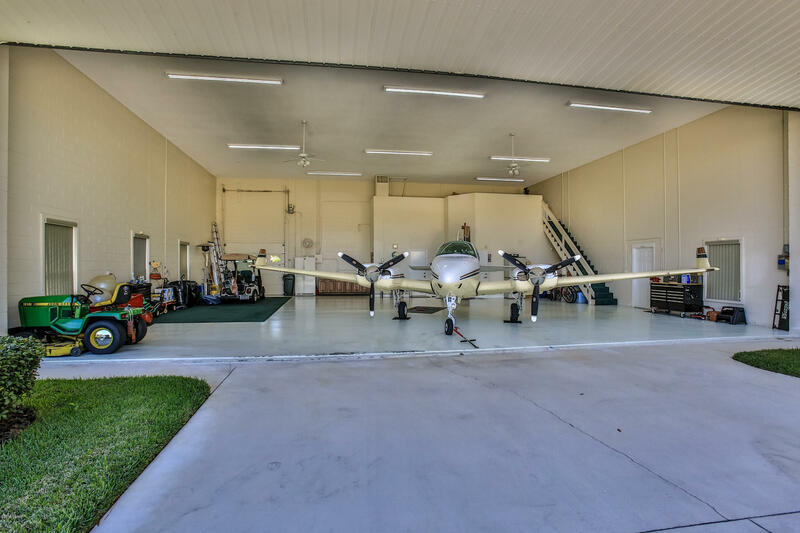 There are multiple a/c systems in house and hangar. 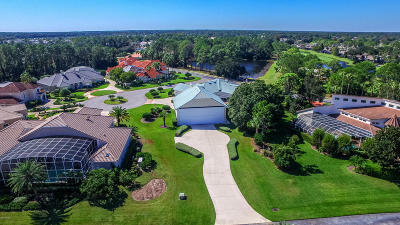 The aircraft ramp is 140' long, the longest in Spruce Creek!. 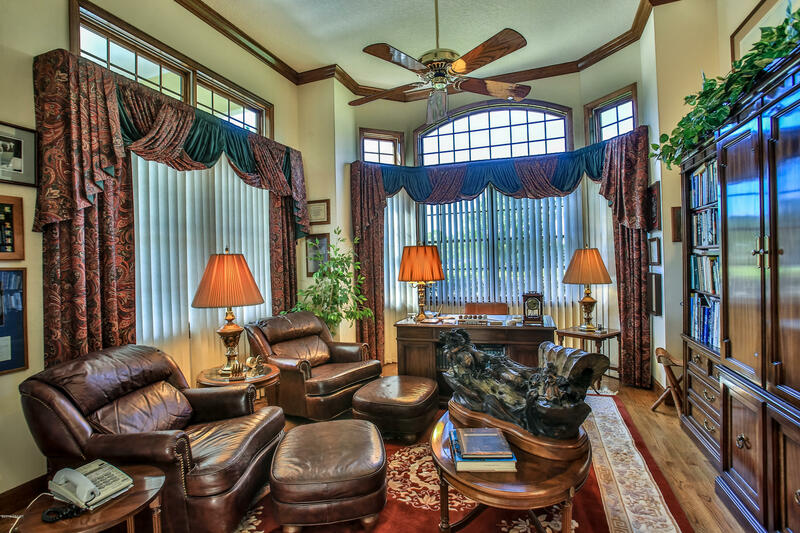 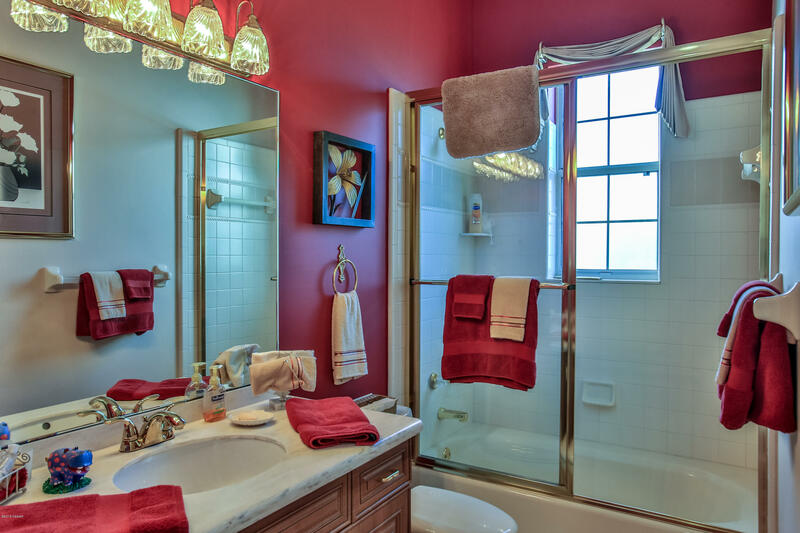 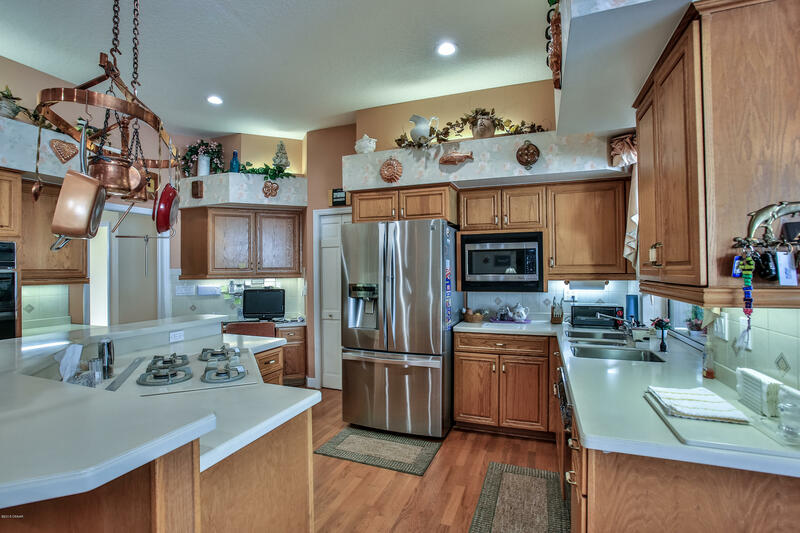 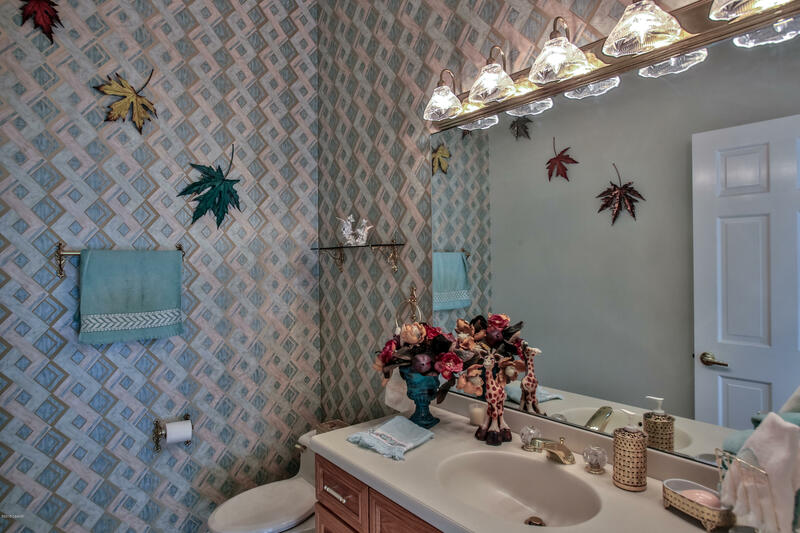 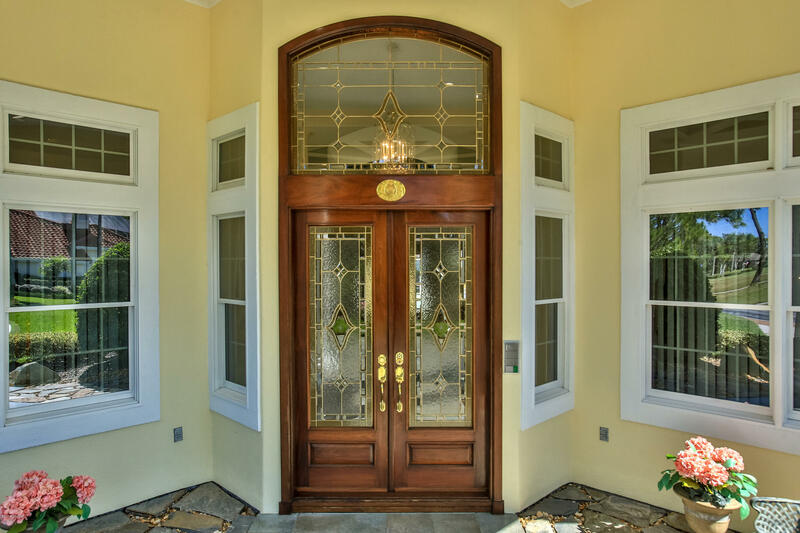 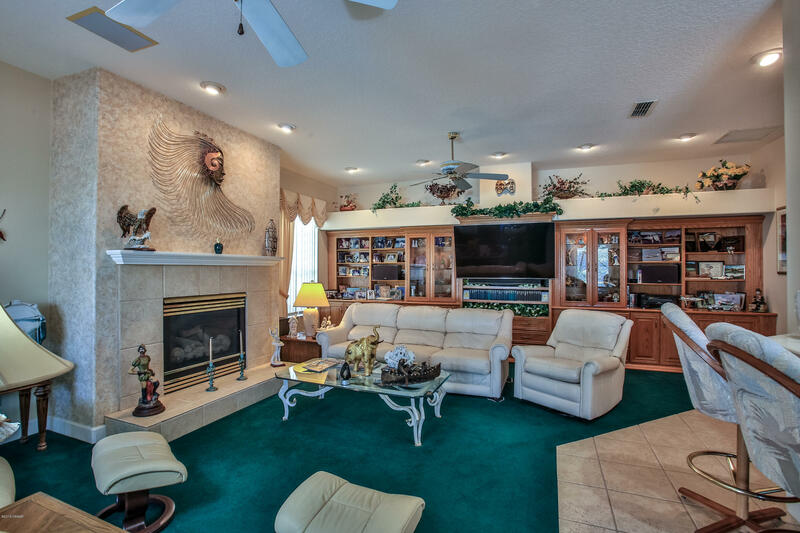 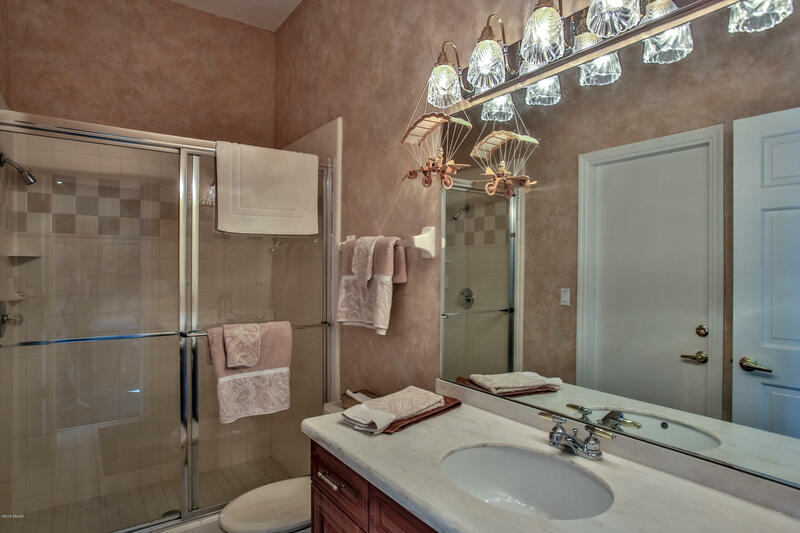 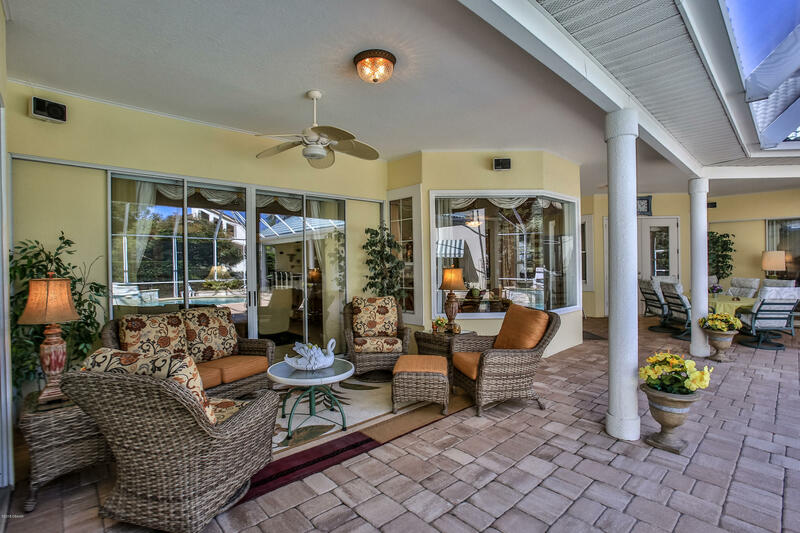 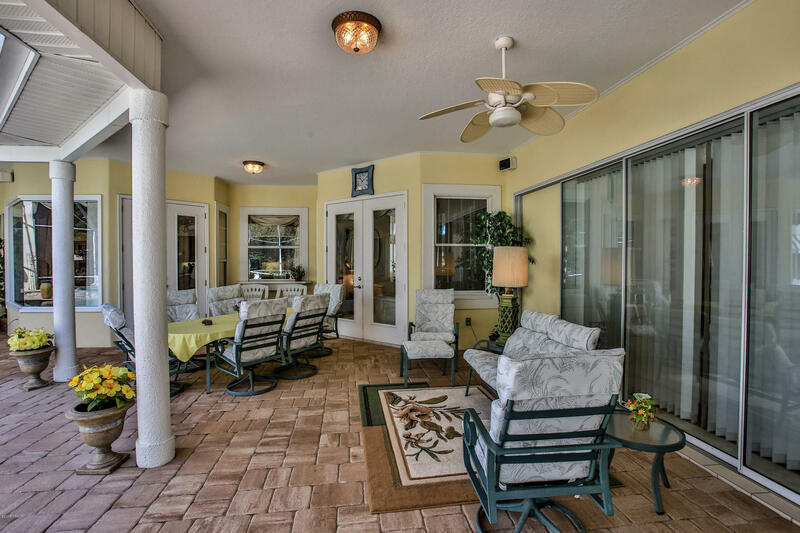 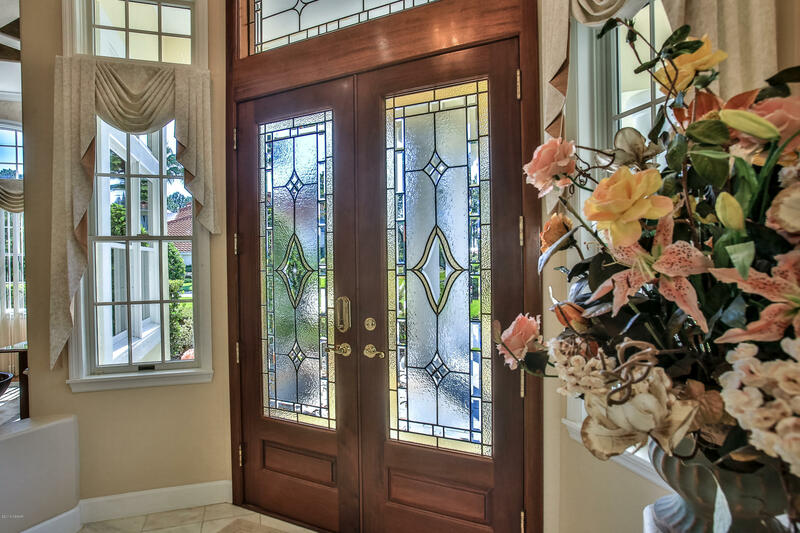 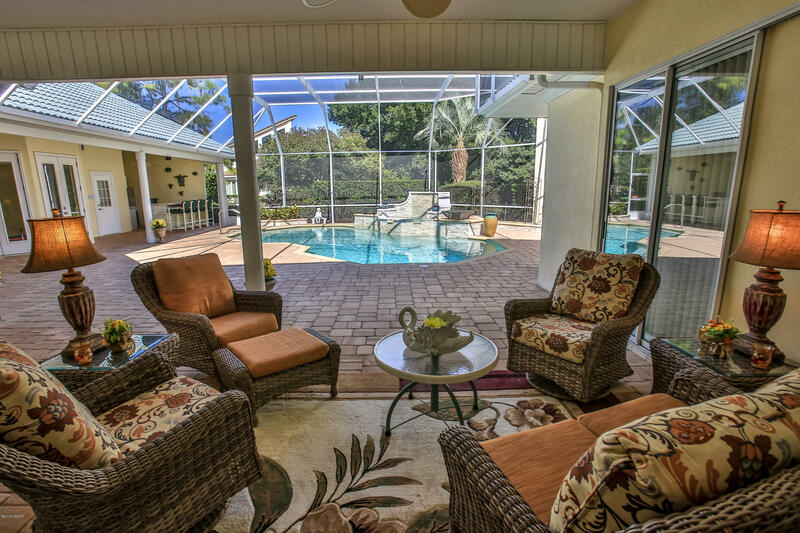 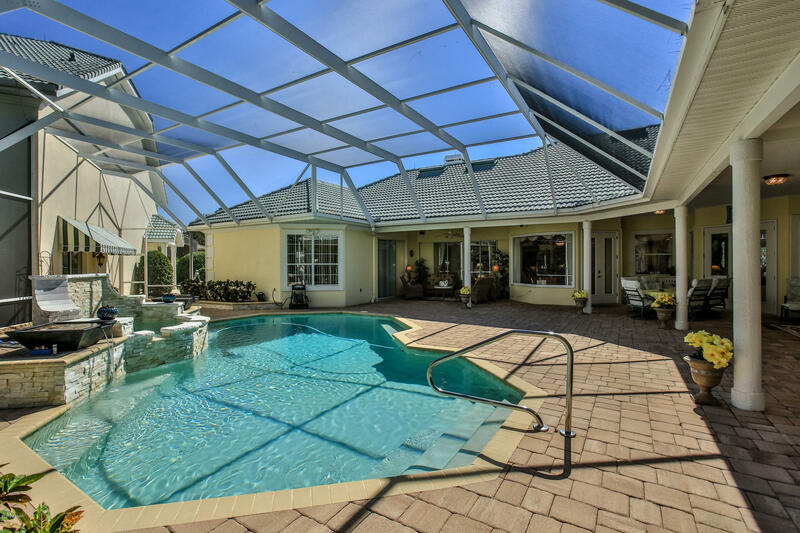 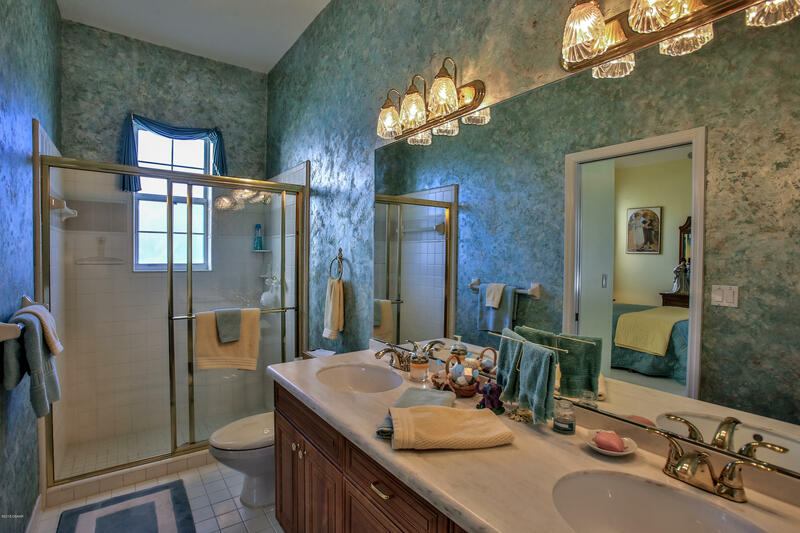 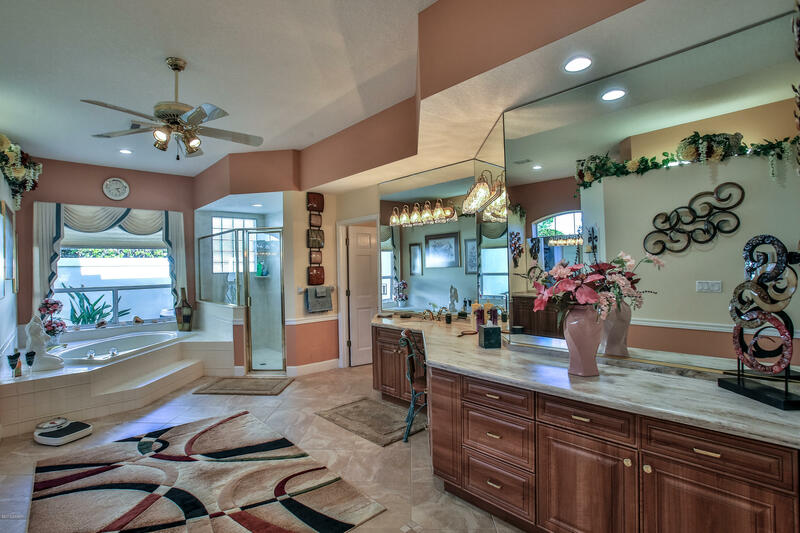 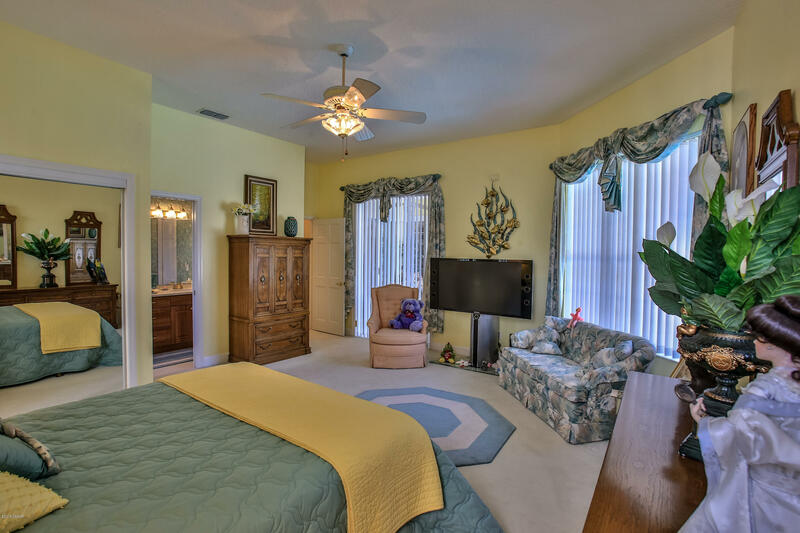 The original owners have meticulously maintained the home, landscaping, pool and hangar. 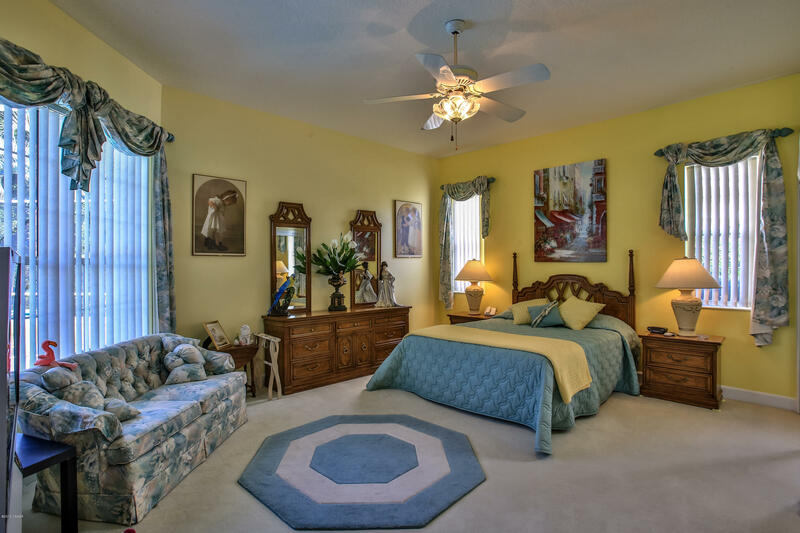 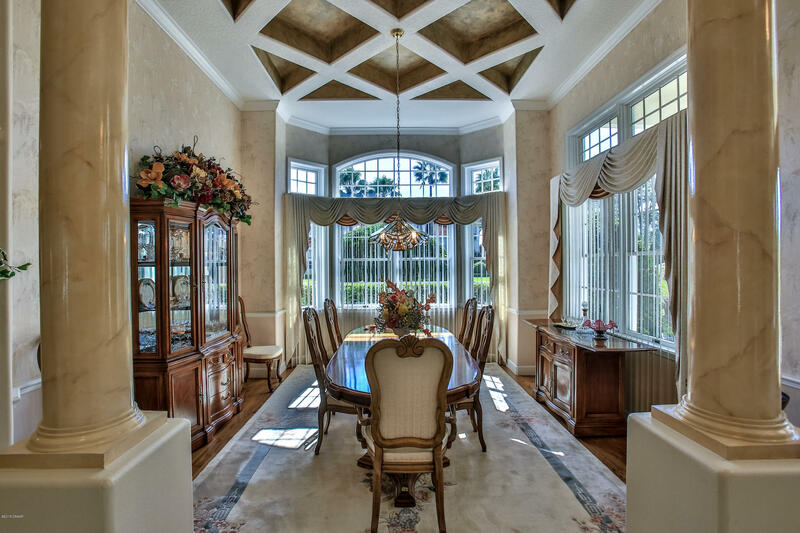 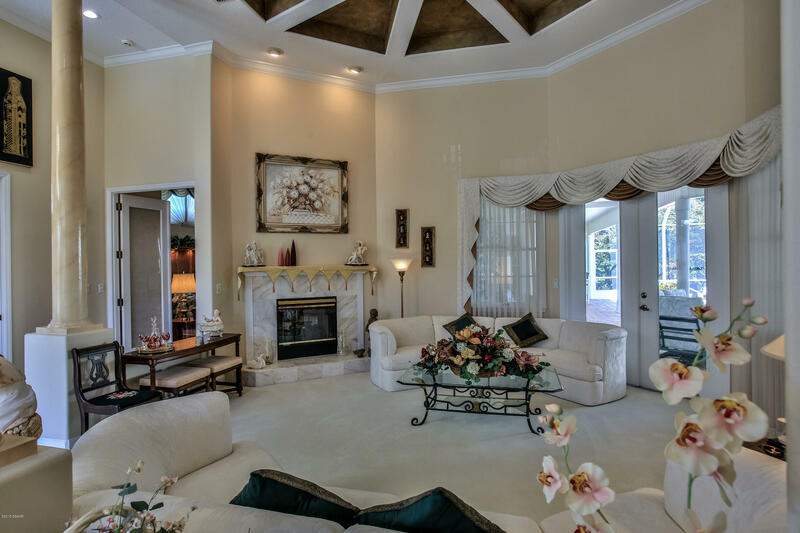 Both formal entertaining rooms have artistically coffer ed ceilings. 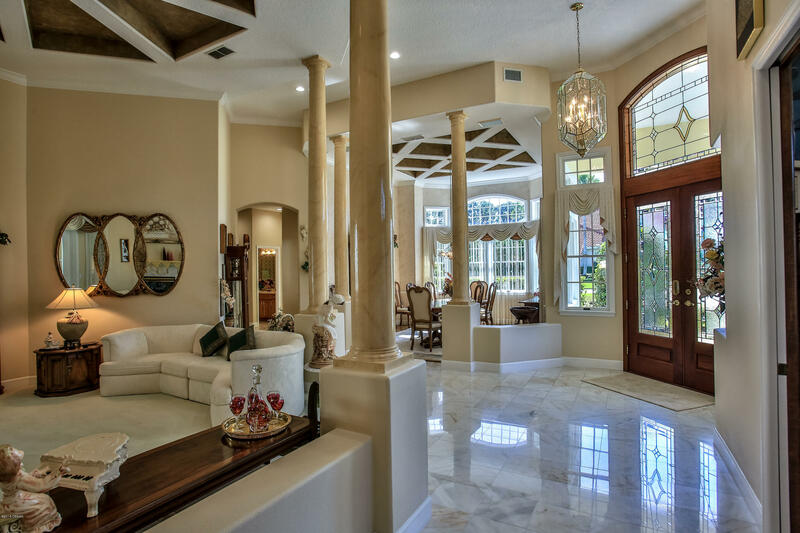 A library/study is provided with plank flooring and detailed in walnut and mahogany with one of the several pocket doors found throughout. 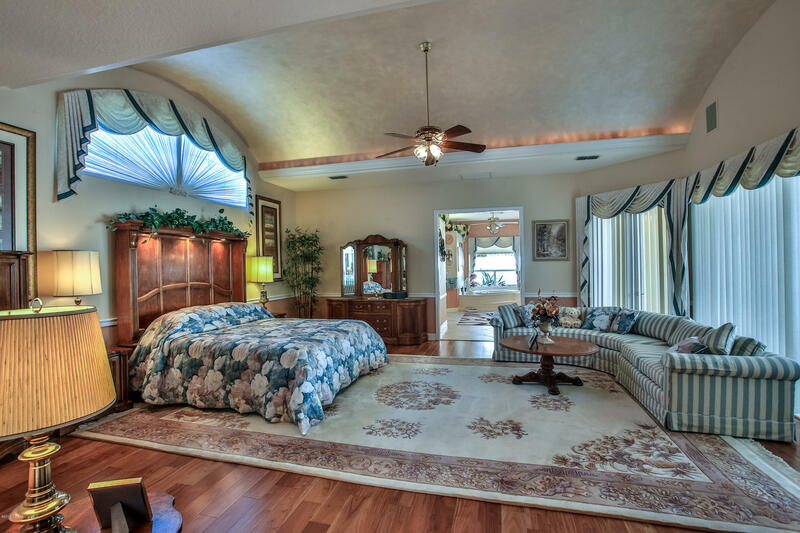 It would also easily flex into a 4th bedroom with very little effort. 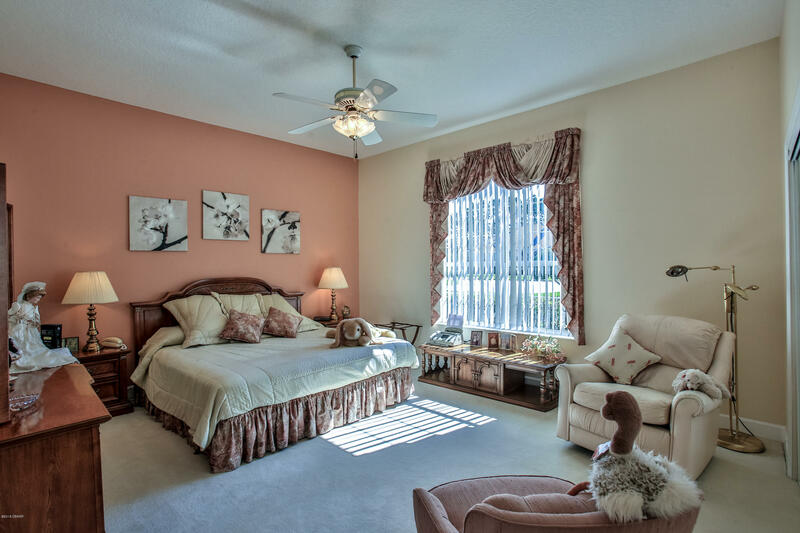 In the convenient "split-plan" configuration are three king sized en-suite bedrooms to provide sanctuary at day's end, with owners' suite rivaling most Presidential Suites. 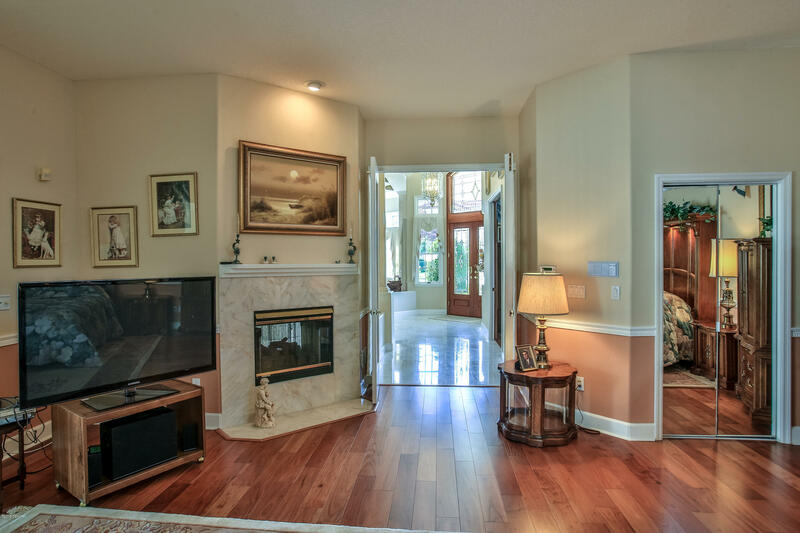 The latter contains three walk-in closets, a marble gas fireplace(shared hearth with living room), barrel ceiling with recessed lighting, and beautiful wood flooring. 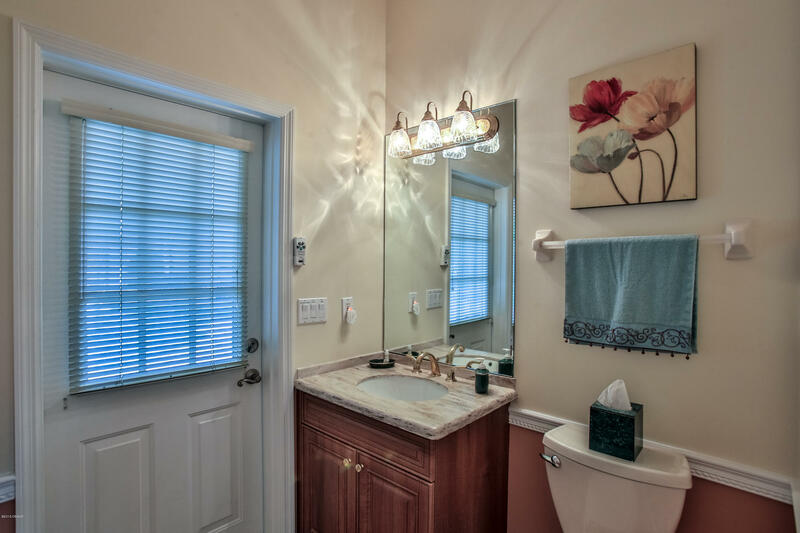 The owners' bath contains walk-in shower, garden soaking tub, separate water closet, separate his/her vanities, and an abundance of custom crafted cabinetry. 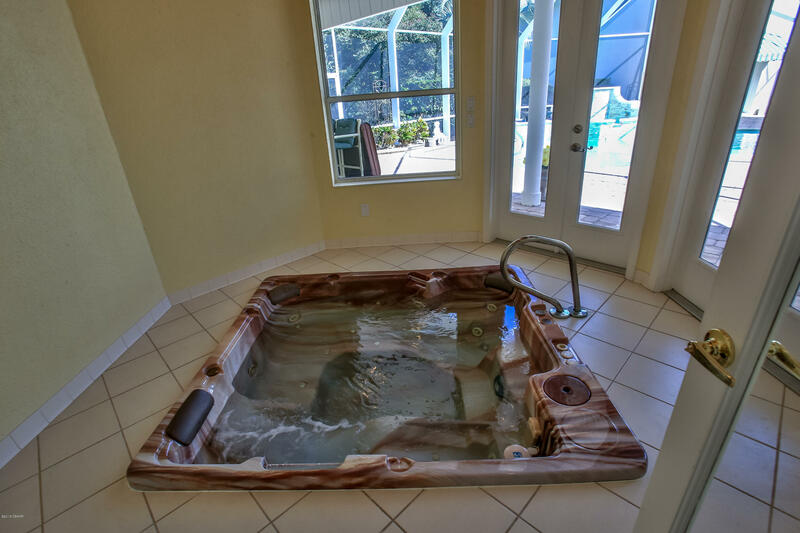 As a bonus, an entire room adjacent to the owners' suite is dedicated to a large sunken spa. 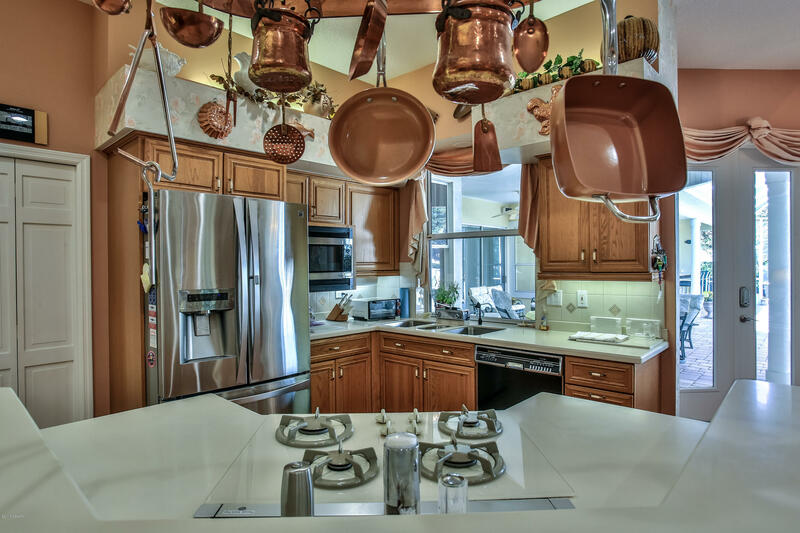 The ergonomic design of the kitchen makes all things culinary including storage, food prep, serving, and dining a pleasure. 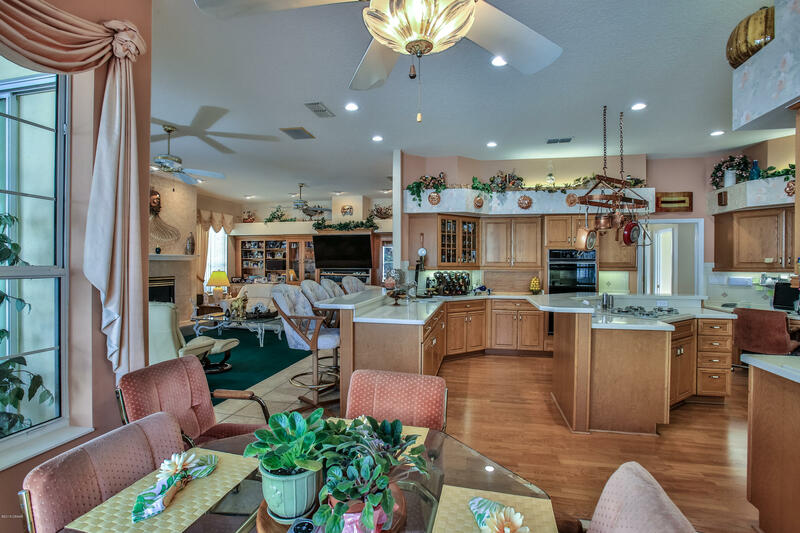 The large center island with gas top cooking, the four-seat counter bar, and the separate breakfast nook, understandably make this a favorite gathering spot. 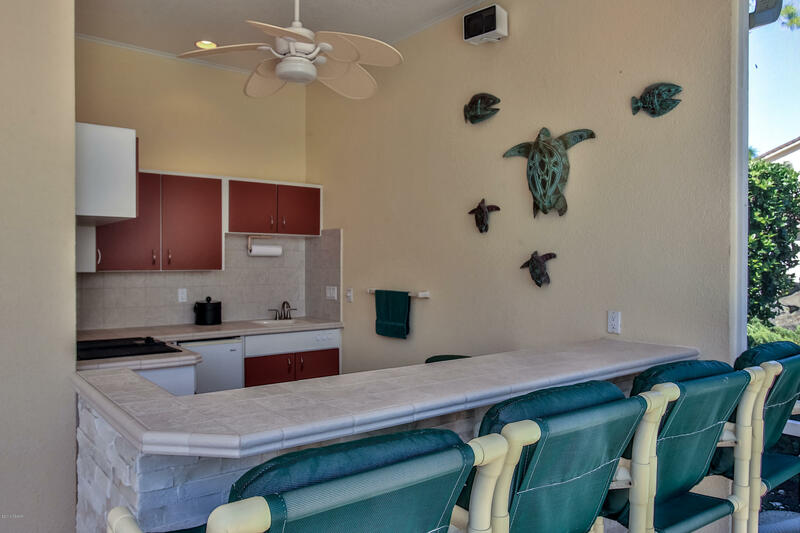 The kitchen has row upon row of custom cabinets, a walk-in pantry, a meal planning desk/computer center, a bar sink, double wall ovens, and a pass-thru service window to lanai. 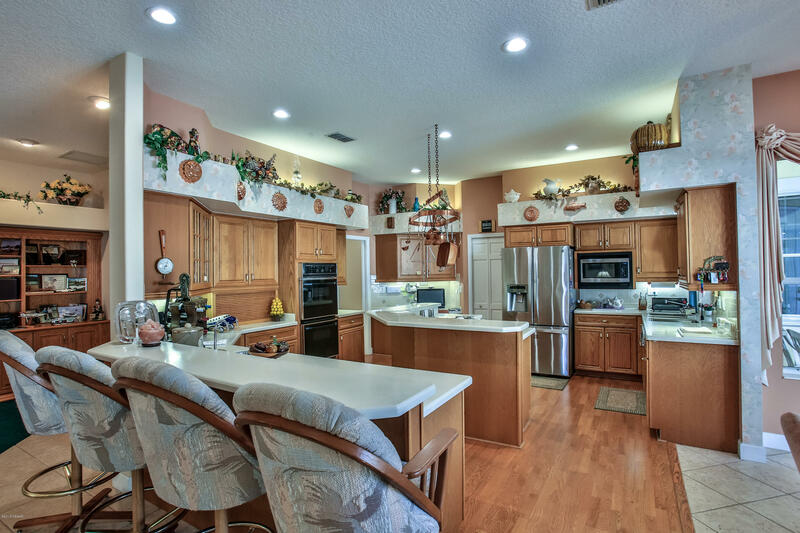 The entire food prep area has a floating wood floor for the "standing" comfort of the cook. 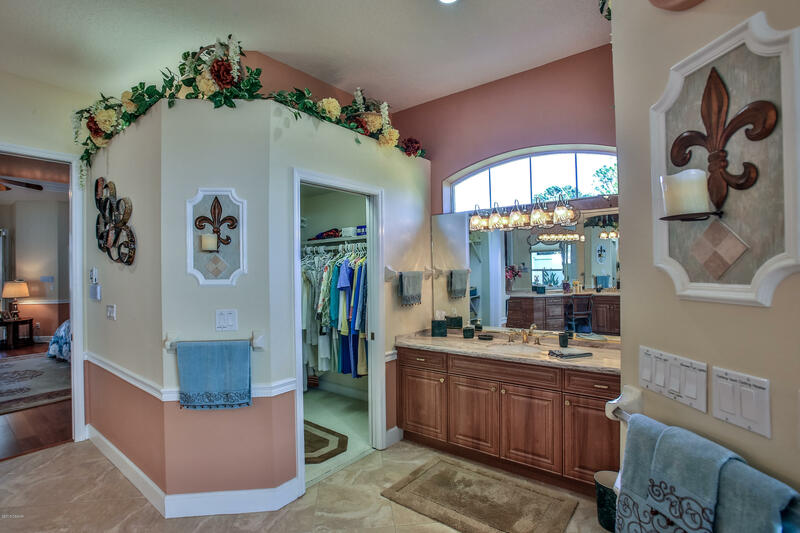 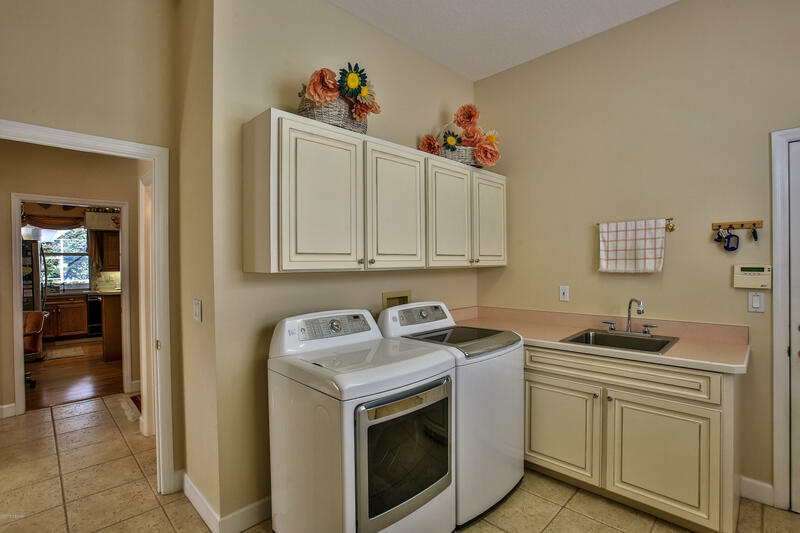 Adjacent to the kitchen is a butler's pantry for central vac equipment, etc., a half bath powder room, and a large laundry room with more counters and cabinetry. 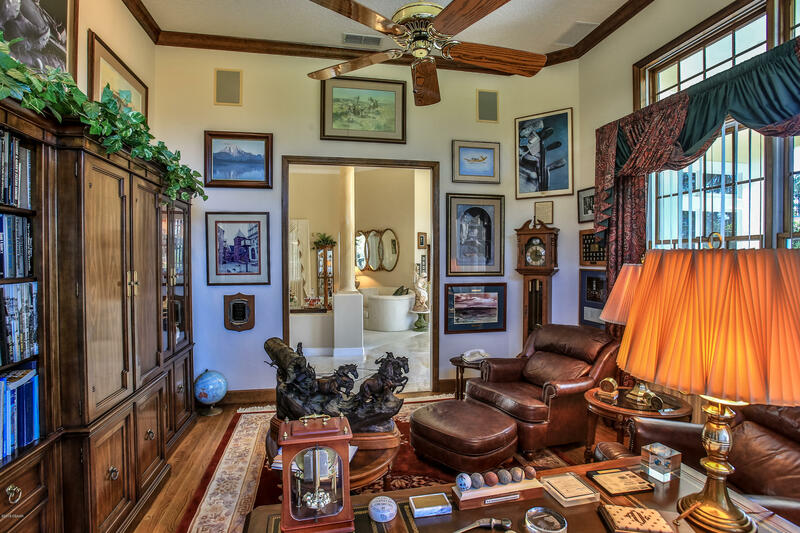 The family room has an entire wall of oak cabinetry for home theater equipment and display shelving for Objets D'art. 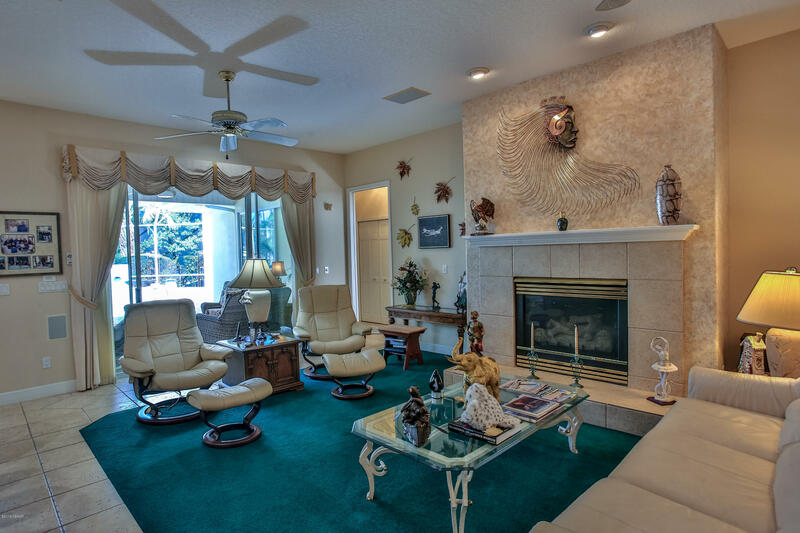 This large yet still cozy room has a gas fireplace. 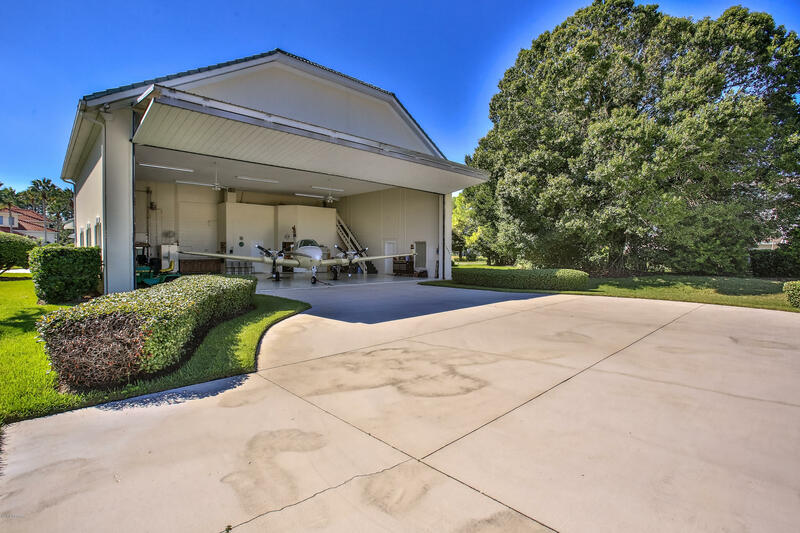 The attached garage measures 23'x25' and the Air Conditioned hangar measures 52'x42' giving the owners' a substantial 2,759 sq.ft. 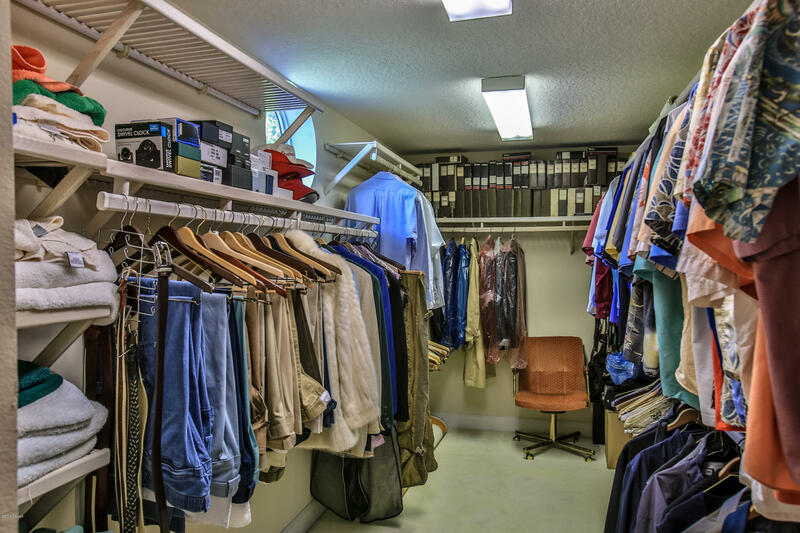 for garaging all motorized vehicles, for land, air and sea. 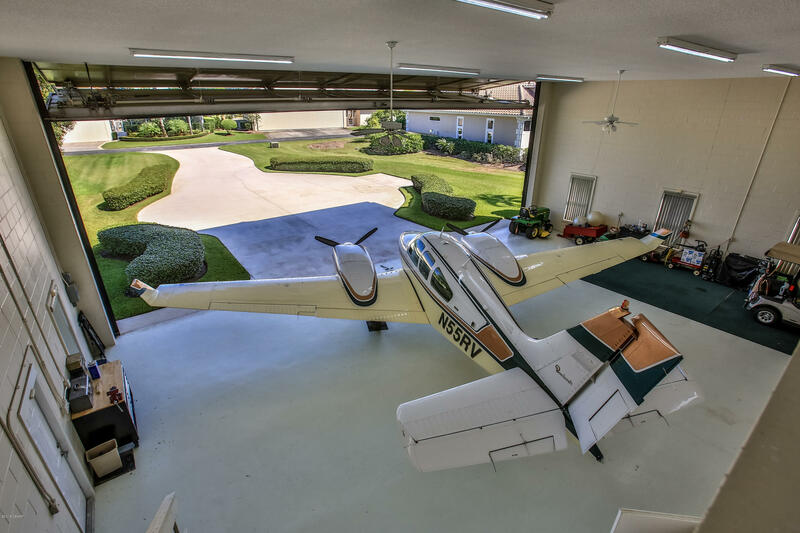 Both have overhead storage, while the air-conditioned hangar offers a pilot lounge and full bath. Hgr insulated aluminum Wilson door measures 48' x 18' plus an 8'11"w x 8'h RV door for golf cart and cars. 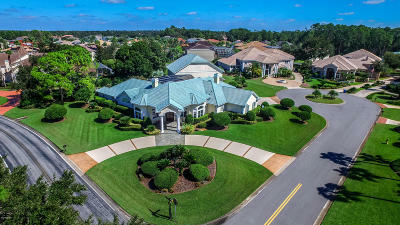 140' long hgr ramp allows ample parking. 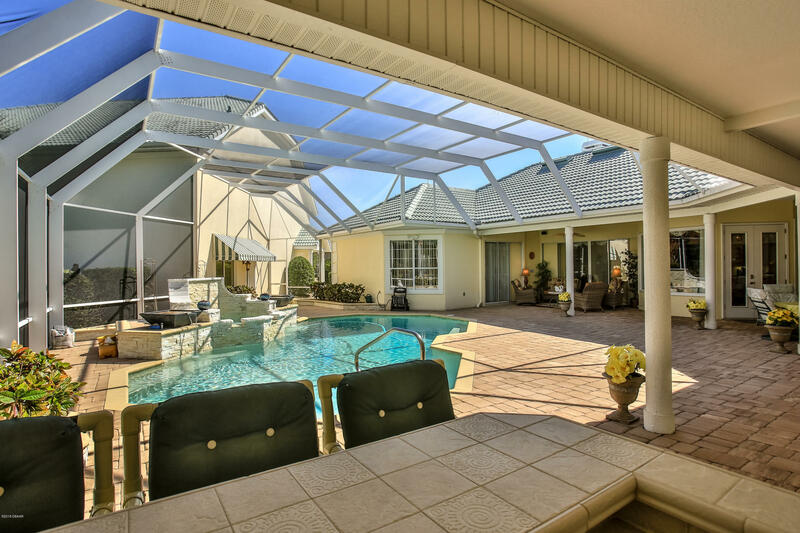 Outdoor living was enthusiastically addressed with spanning sections for swimming, sun bathing, shaded relaxation and dining under roof and recently replaced lanai screening. 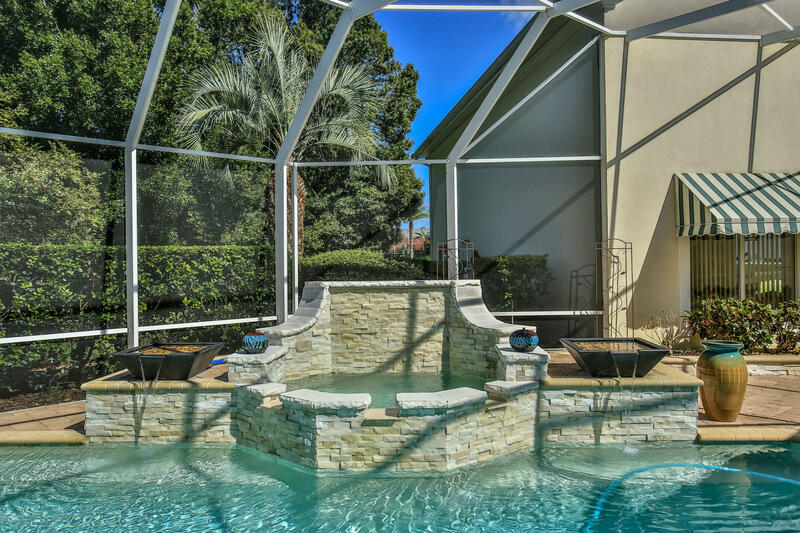 A gracefully designed heated pool with fountains is surrounded by pavers. 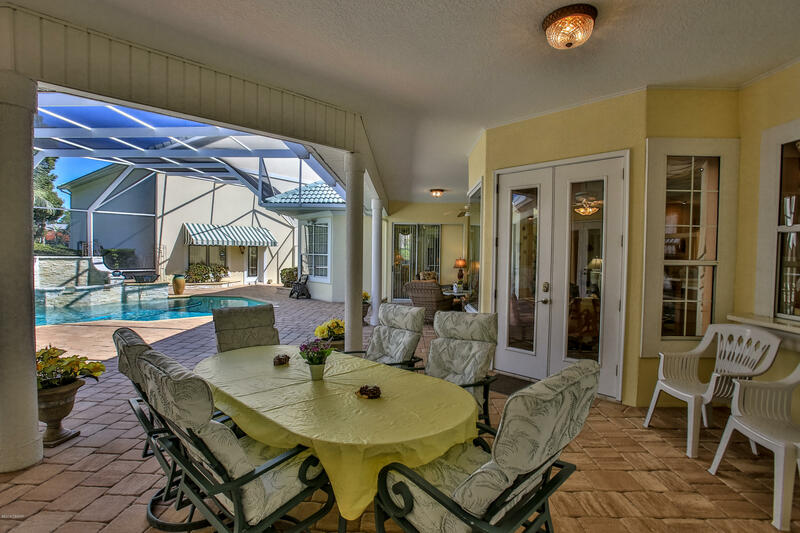 The Summer Kitchen and bar complete the outdoor entertaining.